If you ever wanted to make your web traffic seem like it was coming from a different browser–say, to trick a site that claims it’s incompatible with yours–you can. 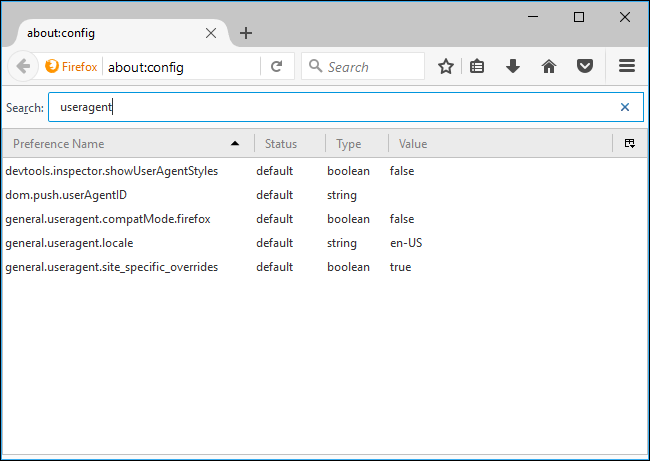 All popular browsers offer built-in user agent switchers, so you can change your user agent without installing any extensions. Websites identify browsers by their “user agents“. Change a browser’s user agent and it will report it’s a different browser to websites. 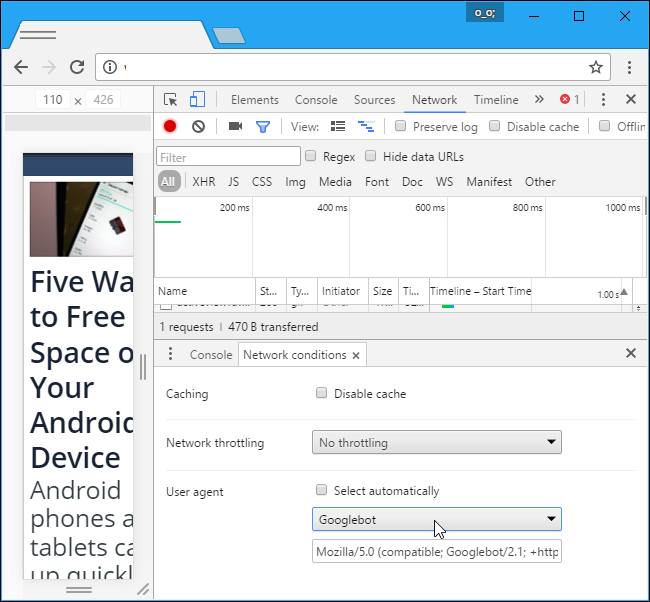 This allows you to request web pages intended for different browsers–or even different devices, like smartphones and tablets. Chrome’s user agent switcher is part of its Developer Tools. Open them by clicking the menu button and selecting More Tools > Developer Tools. You can also use press Ctrl+Shift+I on your keyboard. If you don’t see the console at the bottom, click the menu button at the top right corner of the Developer Tools pane–that’s the button just to the left of the “x”–and select “Show Console”. On the Network conditions tab, uncheck “Select automatically” next to User agent. You can then select a user agent from the list or copy and paste a custom user agent into the box. This setting is temporary. It only works while you have the Developer Tools pane open, and it only applies to the current tab. 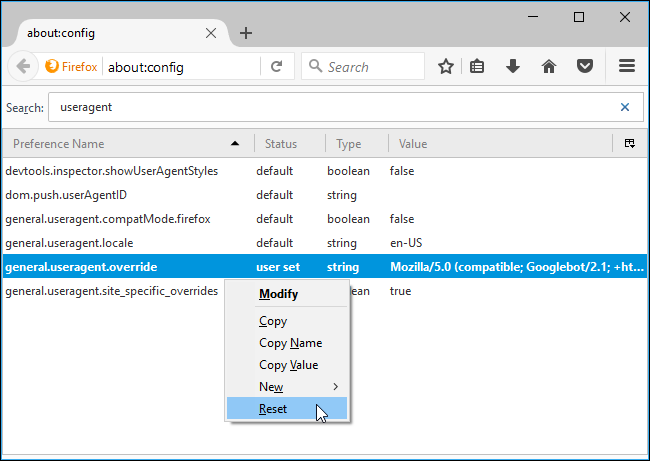 In Mozilla Firefox, this option is buried on Firefox’s about:config page. 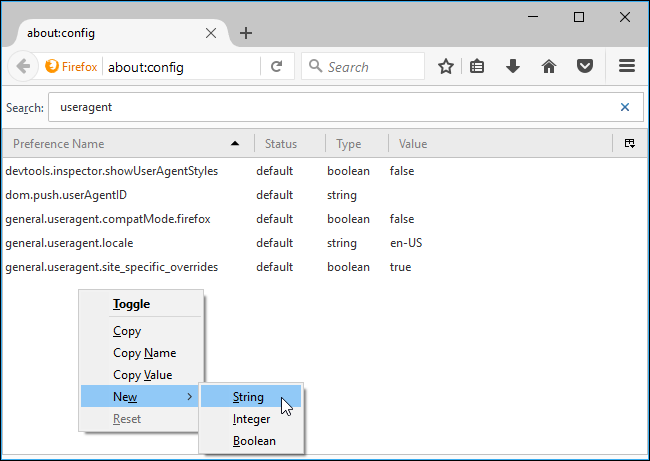 To access the about:config page, type about:config into Firefox’s address bar and press Enter. 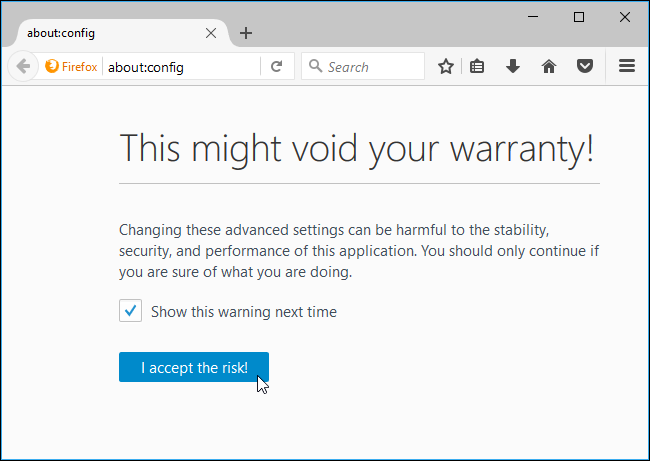 You’ll see a warning–be careful when you change settings here, you could mess up Firefox’s settings. Name the preference general.useragent.override . You can find extensive lists of user agents on various websites, such as this one. This setting applies to every open tab and persists until you change it, even if you close and reopen Firefox. To revert Firefox to the default user agent, right-click the “general.useragent.override” preference and select Reset. 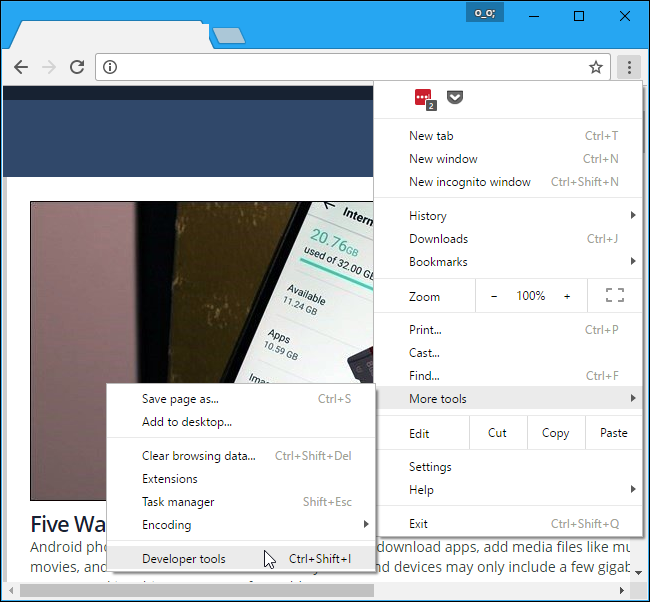 Microsoft Edge and Internet Explorer have user agent switchers in their developer tools, and they’re nearly identical. To open them, click the settings menu and select “F12 Developer Tools” or just press F12 on your keyboard. 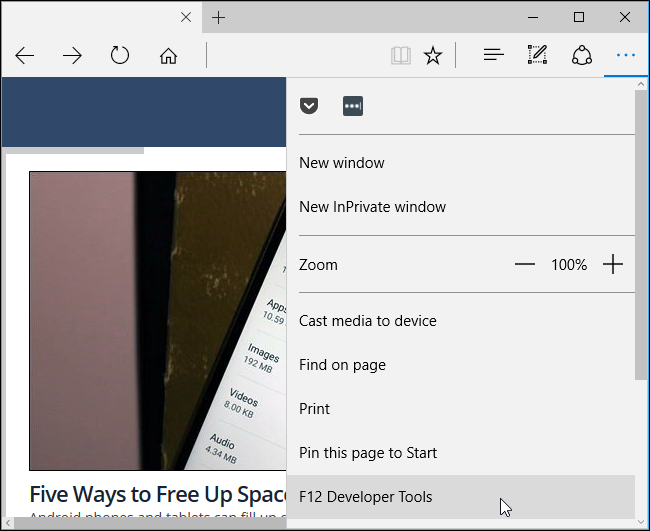 The developer tools will open in a separate pane at the bottom of the window. 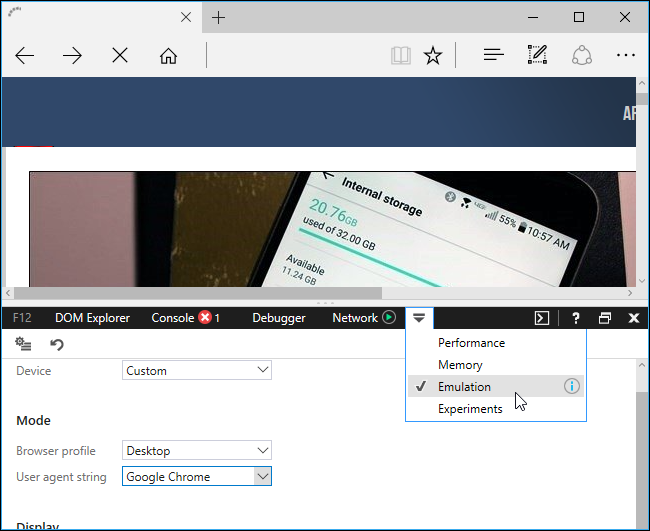 Click the “Emulation” tab and choose a user agent from the “User agent string” box. 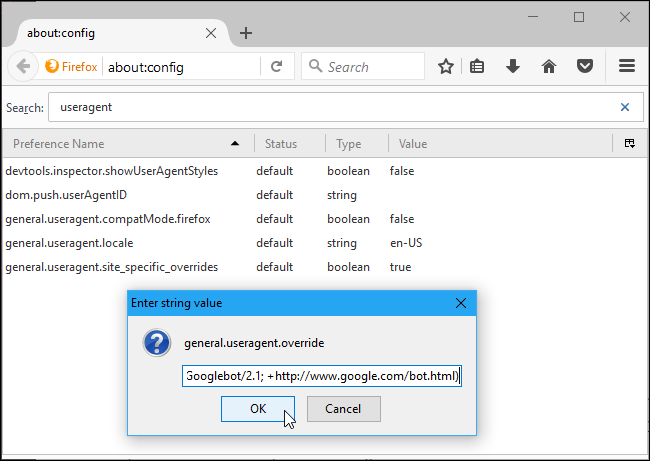 You can also select the “Custom” option in the User agent string list and type a custom user agent into the box. You can find extensive lists of user agents on various websites, such as this one. This setting is temporary. It only applies to the current tab, and only while the F12 Developer Tools pane is open. This option is available in Safari’s normally hidden Develop menu. 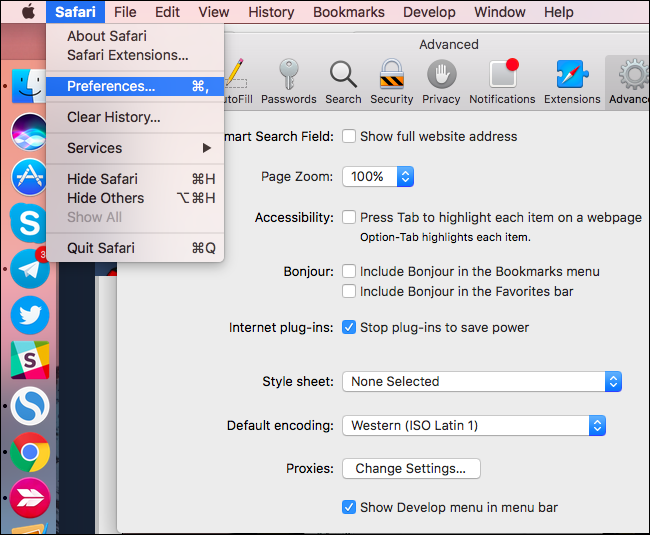 To enable it, click Safari > Preferences. Select the “Advanced” tab and enable the “Show Develop menu in menu bar” option at the bottom of the window. 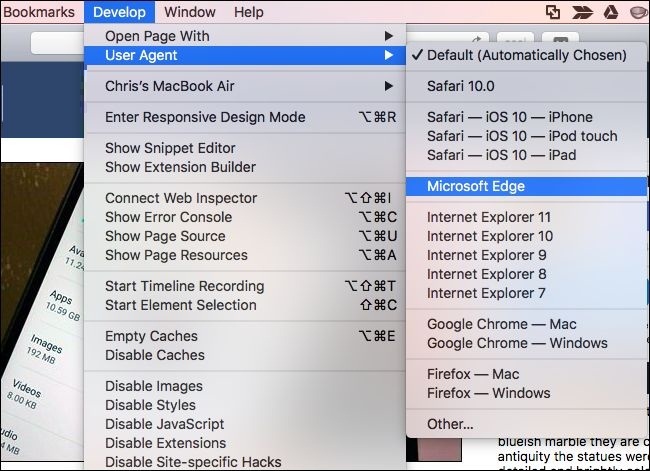 Click Develop > User Agent and select the user agent you want to use in the list. If the user agent you want to use isn’t shown here, select “Other” and you can provide a custom user agent. You can find extensive lists of user agents on various websites, such as this one. This option only applies to the current tab. Other open tabs and tabs you open in the future will use the “Default” user agent.